Qualcomm has further narrowed its first USITC complaint (request for import ban) against Apple. 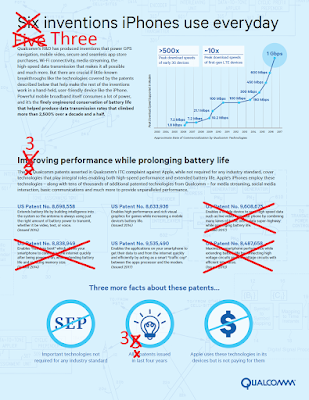 It originally brought the complaint in early July 2017 and published a full-page infographic with the following headline: "Six inventions iPhones use everyday [sic]"
Withdrawals of patents and claims are expected by the ITC and necessary for the trade agency with quasijudicial powers to keep its ambitious schedules. Qualcomm's first withdrawal of a patent-in-suit came at an unusually early stage of proceedings: only a couple of weeks after the ITC had instituted the investigation. The day before yesterday, Qualcomm withdrew, besides claims from other patents, all asserted claims of U.S. Patent No. 8,838,949 and U.S. Patent No. U.S. Patent No. 9,608,675. Between those withdrawals in the first ITC case, Qualcomm brought a second ITC complaint against Apple (in the fourth quarter of 2017). At a February hearing held by the Munich I Regional Court, Qualcomm's German counsel expressed an intent and offered a prediction: Quinn Emanuel's Dr. Marcus Grosch said he was expecting to secure a German patent injunction for his client by August or September of this year. The next Munich hearing will take place next Thursday (May 3). First hearings in Munich serve the purpose of discussing the key issues the court has identified based on the complaint and the answer to the complaint. At that stage, validity usually isn't discussed yet. Next week's hearing will be about the German parts of four European patents from the same family, each covering a "method and device for communication channel selection": EP1956806, EP1955529, EP3054658, and EP3094067. It appears that the claimed inventions were made by SnapTrack, a GPS-focused Silicon Valley startup aquired by Qualcomm in 2000 for $1 billion. Since I'm still in Munich, I'll attend and share my observations here. Someone wrote on Twitter that patent holders had something to celebrate yesterday: After the Supreme Court's Oil States (7-2 confirming constitutionality of PTAB inter partes review) and SAS (5-4 holding that PTAB must render decision on all challenged patent claims after granting review), patent holders were allegedly in a stronger position than before, which--as the same tweeter (I forgot the name) noted--is rarely the case when the Supreme Court overrules the Federal Circuit as it did in SAS. Classical spin doctoring? A comparison of the number of amicus briefs filed shows where most of the attention was. 54 briefs in Oil States vs. only 2 in SAS. If patent holders at large had cared a lot about SAS, more of them than just the Intellectual Property Owners Association (amicus brief, PDF) would have chimed in. However, many of those who'd have preferred to have done away with PTAB IPR in the first place presumably welcome anything that adversely affects PTAB's operational efficiency--and even when (as is the case here) it's not easy to predict the fallout, someone who hates PTAB probably just thinks it can hardly get worse from that particular vantage point. It is perfectly plausible that many experts believe the USPTO, which on average grants IPR under the America Invents Act with respect to not even half of all the claims that are challenged, may now have to hand down decisions on twice as many claims and may, in order to keep its workload at the same level, simply deny a lot of petitions that might have previously succeeded because they raised issues worthy of review with respect to one or more, but not all, challenged claims. That would be understandable, but not desirable. At the same time, under a Republican administration and a Republican Congress it would be hard for PTAB to get a whole lot more resources. Unfortunately, some of what's going on politically aims to weaken PTAB. 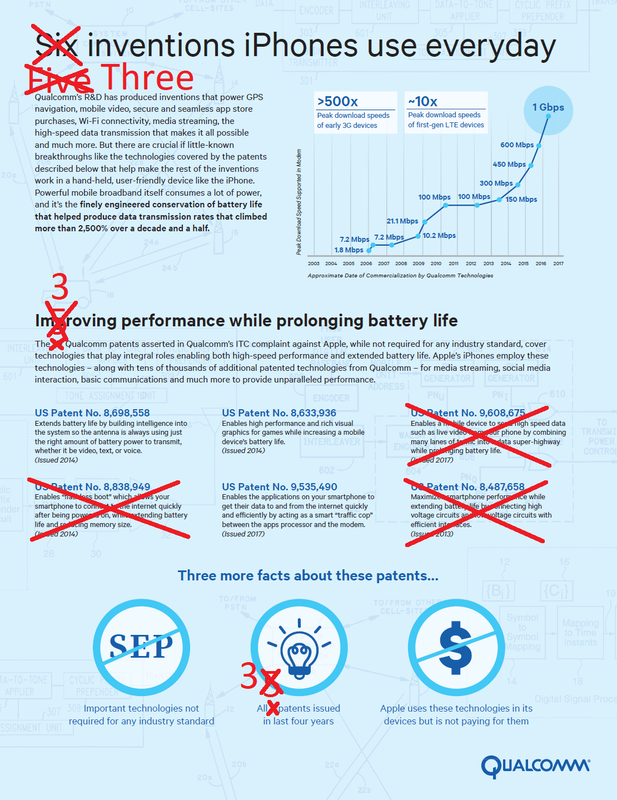 The PTAB IPR timeline is tight. The AIA says a final written decision must come down within one year of instituting a review. For good cause, this can be extended by up to six months. That framework doesn't lend itself to simply taking twice as much time per case while waiting for more resources. First, if challenges to claims are so weak that those claims wouldn't have been reviewed in the past, the average per-claim effort to uphold those claims on review should be less--the question is, however, how much less--than a rejection decision. Also, while the number of claims to rule on may (more than) double, all challenges already had to be looked at in the past to form an initial opinion. More work for PTAB for sure--but probably not twice as much. Second, a much bigger factor than the previous one. It's not a static environment where all players will behave just as before, except that PTAB has to make an all-or-nothing review decision. Different types of petitioners will pursue different tactics, and as PTAB reactively (but probably rather quickly) adapts to the effects of numerous tactical decisions, the players will adjust their tactics. In the "smartphone patent wars" I've seen some of the most extreme stalling efforts one could imagine. There was one Android device maker that had hardly any patents (especially not patents of the kind that would scare anyone) to countersue, but its lawyers were stalling artists on both sides of the Atlantic. Then there was Apple, which generally had a great deal of urgency in cases in which it was the only part asserting offensive claims, or was asserting more or potentially more impactful ones, while taking its time when defending itself--but nowhere near as extreme as some Android companies. Microsoft was pretty unique because it tried to accelerate pretty much everything (except maybe ITC proceedings in which it was the respondend). For an example, Microsoft went to a UK court to obtain a quick ruling on a Motorola patent in order to influence some German decisions, and it obtained an antisuit injunction to prevent Motorola from enforcing two German patent injunctions (arguably, an antisuit injunction is a form of stalling, but unlike traditional stalling, it requires speed in one jurisdiction). PTAB IPR petitioners are also diverse. Some primarily want to slow down infringement proceedings, which often get stayed. Others are more focused on strategically striking down certain claims. Some "stallers" may like parallel proceedings where they challenge some claims before PTAB and others in district court. Post-SAS, if more claims of a patent are reviewed than would have been reviewed before, litigation estoppel may result in some consolidation. That was a policy argument made by those advocating all-or-nothing. In my opinion, that was a far weaker policy argument than efficiency, especially in light of all the positive effects of PTAB on "patent hygiene," but we'll get to what the case turned on in a moment. Statistics will show some SAS effects, but I'm quite sure many petitioners will now choose more wisely--especially once the percentage of granted petitions goes down. No one will act in the interest of the collectivity of all petitioners; as always in litigation, each party will do what serves its own interests. But sometimes that does, in the end, also serve a greater good. If even outsiders like me can sometimes (especially if we take the necessary time for research) figure out which invalidity contentions are relatively strongest, petitioners and especially their counsel should have a clear idea of realistic priorities in most cases. Probably not immediately, but after a year or two, I guess the number of claims challenged on a per-patent basis will drop significantly. PTAB efficiency wasn't really the Supreme Court majority's primary concern here. The Supreme Court does usually promote balance in patent litigation. But here, the efficiency impact of the procedural question at issue was of limited importance, and absolutely not outcome-determinative (as the result shows). In Oil States, the Supreme Court had only two dissenters (Justice Gorsuch, joined by Chief Justice Roberts). All others supported PTAB IPR, with some left-wingers (Justice Breyer, joined by Justices Ginsburg and Sotomayor) filing additional thoughts in concurrence. By contrast, SAS resulted in an ideological 5-4 right-left split. The tweeter I mentioned further above would undoubtedly have preferred it the other way round: a 5-4 decision against PTAB in Oil States (then SAS would have been moot). Justice Gorsuch has now been on the opposite side of my desired outcome in three cases (Dimaya, Oil States, and SAS) in short succession. I still like his judicial style very much--including his highly explanatory writings that others mock as #GorsuchStyle. He's an independent thinker, and despite his great background (including his family) and career, he's absolutely not an "elitist" of the kind that Trump supporters like me view skeptically. I wouldn't describe him as anti-elitist, but his take on Chevron (deference to government agencies) shows that he has less trust in unelected elites in government agencies than in elected lawmakers. And that's what SAS ended up being about more than anything else. The Ginsburg-Breyer style is reflected by their dissenting opinions: the majority's literal reading of the statute in question is deemed "wooden," the statute is allegedly "difficult" (while to Justice Gorsuch and his entire camp its language is crystal clear), the USPTO should have the wiggle room to second-guess lawmakers (it's not just "what" Congress wanted and "why," and it comes across as extremely liberal when they suggest judges should simply take the position of "reasonable" legislators). By contrast, the majority opinion, while the outcome is inefficient, is a principled one. It's almost like saying "stupid but constitutional" (three words that Justice Scalia told his clerks and other jurists). The first Chevron hurdle requires a lack of clarity: lawmakers' intent must not be discernible. Only then can a government agency adopt its own rules, provided those are reasonable. I honestly wish the intent of Congress had not been perfectly discernible in this context. Then the more efficient PTAB approach (reviewing only claims that face a credible challenge) could have been affirmed. But while I agree with the left wing on policy, after reading everything I can appreciate why no conservative judge would have been prepared to concur for a different set of reasons with the left camp and affirm the Federal Circuit majority. The sole linguistic argument for a lack of clarity was centered around the reference to claims challenged in the "petition" in one place and "by the petitioner" in the relevant statute here, but that is a small difference and justified by the fact that initially there's a petition, but later the petitioner might have dropped challenges (under a settlement). The legislative record provides a few quotes from Capitol Hill lawmakers that really support the idea that all claims challenged by a petitioner should be reviewed, or none at all. Ultimately it came down to how high the first Chevron hurdle should be. No conservative judge could have set the hurdle low enough for affirmance in SAS without spill-over effects on numerous other cases in which government agencies set their own rules. "But whether Chevron should remain is a question we may leave for another day. Even under Chevron, no affirmance]." It's just an occasional remark, so it may not mean too much that no member of the majority dissented from it. But imagine a patent ruling in which the Supreme Court would say: "But whether eBay should remain is a question we may leave for another day. Even under eBay, [...]"
Chevron may be history at some point as the friends of Big Government and DC elites don't have a majority on the current Supreme Court. With such a strategic target in mind, there was no way that conservative justices could have widened the applicability of Chevron in a patent case that wasn't really about life or death of the innovation economy (unlike eBay, or even the Samsung design patent damages case, by way of comparison). Justice Gorsuch has finally positioned himself as the thought leader of the Chevron-critical movement. What's remarkable is that Chevron upheld an air quality standards regulation by the Environmental Protection Agency (EPA), which at the time was headed by Anne Gorsuch Burford, Justice Gorsuch's mother. The Chevron opinion by the Supreme Court refers, in the context of the history of the case, to Natural Resources Defense Council, Inc. v. Gorsuch, an appeal (of an EPA decision, thus Mrs. Gorsuch was formally the defendant) decided by the United States Court of Appeals for the District of Columbia. On May 14, Apple and Samsung will square off in court again. It's going to be the third trial in their first California case alone. What makes it interesting is that it will involve a design patent damages determination (damages in this case amounting to a disgorgement of infringer's profits) following a Supreme Court ruling in the same case. The exact amount of money that will change hands between Apple and Samsung won't impact the parties' positions in the smartphone market. However, it will be a signal to other design patent holders, including patent trolls. Should Apple be awarded a huge amount that Samsung could ultimately afford but the equivalent of which would potentially put many other companies out of business, design patents would be used in aggressive, extortionate ways. Last week, Judge Lucy Koh ruled on the parties' Daubert motions. Daubert motions and rulings are hard to figure out from the outside unless they're just about numbers (such as damages claims that a court does or does not permit) because one would need to know the related expert reports to really understand the context. What became clear to me from Judge Koh's ruling, however, is that she gave Apple various opportunities beyond the test proposed by the United States government in 2016 to argue that the relevant article of manufacture for a disgorgement of design patent infringer's profits in this case is an entire phone, not just a casing. While Judge Koh adopted the broad lines of the DoJ's proposed test, her Daubert order explicitly and intentionally declines to apply parts of what the DoJ had argued in its amicus curiae brief to the Supreme Court. This week, Apple and Samsung filed their motions in limine. Judge Koh allowed either party to bring three such motions for excluding evidence from the upcoming trial. Motions in limine are more instructive for third-party observers like you and me because one can largely understand their meaning without having access to the parties' expert reports, and because it's often very telling what kinds of evidence a party believes would be particularly prejudicial to its case. Let's see how Samsung will respond to this motion, but it won't be easy to persuade Judge Koh that this kind of evidence should be admitted now in the article-of-manufacture context if it was excluded from the previous damages retrial. It's not that it isn't interesting or powerful. In fact, if the jury saw this, it could have a major impact in Samsung's favor. But Judge Koh's cherished "Groundhog Day" principle is that what wasn't allowed at previous Apple v. Samsung trials won't be allowed next time. In that second motion in limine, Apple seeks to preclude Samsung from referring to "unasserted patents." If you scroll through the above PDF document, you'll see that the term "unasserted patents" relates to a wide array of rather disparate references to other patents. The question Judge Koh will ask herself is whether or not the probative value of any evidence is outweighed by prejudicial jury confusion. I'd be surprised if she agreed with Apple on each and every part of that motion. For an example, Apple argues that patents not asserted in this case are irrelevant to the determination of the relevant article of manufacture. However, I can't see how the existence of other smartphone-related patents (utility patents as well as design patents) would not have probative value: the single strongest argument for a narrowly-defined article of manufacture (just the casing) simply is that there is so much more in and on a smartphone than just a very few, narrow designs. Therefore, if the unapportioned profits made by Samsung with entire devices were to be disgorged, everything else would be deemed to have no commercial value at all (which would be a ridiculous proposition, of course). Just like I would probably grant Apple's first motion in limine at first sight, I'd largely or completely deny the second one because Samsung must have the chance to argue to the jury--not only, but also on the basis of other patents--that other patents cover other elements of smartphones. "The most idiotic source of much of Apple's patent litigiousness has been the design patents -- almost all of the claims being totally farcical. 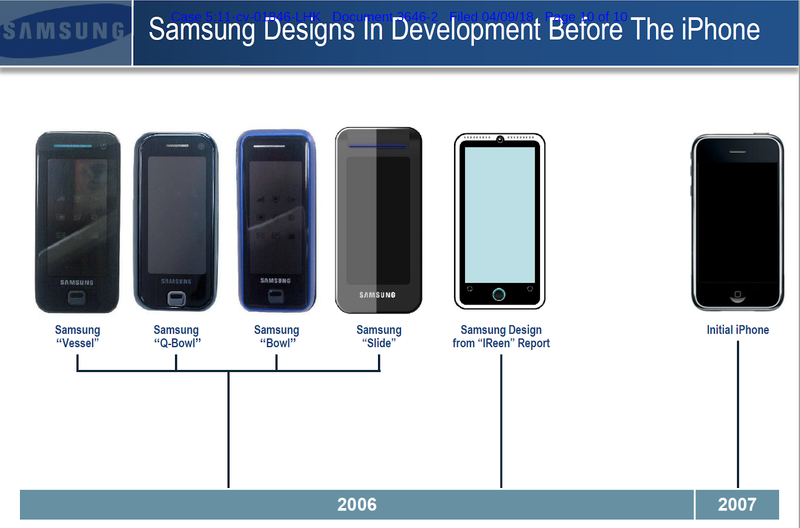 For example, they claimed 'rounded corners' on rectangular phones. Hope you discuss that." That would indeed be unfair to Apple. 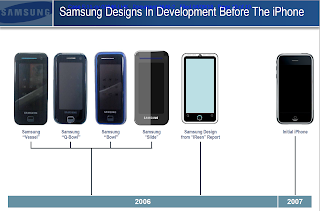 This blog has previously debunked the "rounded corners" myth; but that still doesn't mean that anyone could reasonably support a disgorgement of infringer's profits generated with entire devices. Apple's third motion in limine is hard to analyze from the outside; let me say that for now I'm unconvinced of it. It's about evidence from after the period relevant to the damages determination the jury will have to make. For an example, Samsung provided some screenshots from Amazon's website that show replacement smartphone casings (with a screen) that are sold separately and at a price much lower than that of an entire phone. If the point Samsung wants to make is that casings are sold separately, I'm not sure the exact date matters. It certainly can't matter if the underlying facts (such as the availability of such replacement parts) was already true during the damages period. Samsung's first motion in limine seeks to "preclud[e] Apple from offering evidence, testimony, or attorney argument that improperly implies that Samsung's increased market share was caused by the introduction of features found to infringe in this lawsuit," such as the claim "that Samsung’s market share increased because of the introduction of features found to infringe." Samsung says such evidence was previously allowed because it was relevant to an analysis of profits that Apple lost, but it isn't relevant now that it's all about the article of manufacture and Samsung's related profits. For now it is indeed unclear to me how that kind of evidence would help--and not just confuse--the jury with respect to the article-of-manufacture determination. Let's see how Apple will respond. Just like Apple's second motion in limine is the broadest one, so (though by far not equally broad, and clerly stronger in my view) is Samsung's second motion "for an order prohibiting Apple from presenting evidence or argument suggesting that this Court, the prior jury, or the U.S. Patent and Trademark Office ('PTO') has already determined the articles of manufacture to which Samsung applied the patented designs." One of the things Apple would like to do is highlight to the jury how often the words "an electronic device" appear in the design patent documents. I agree with Samsung that the United States Patent & Trademark Office didn't accept or reject certain claim language with a view to an article-of-manufacture determination in a future damages case. No matter how often a patent says "an electronic device," it may nevertheless just relate to a component. Samsung's third motion in limine relates to the '915 pinch-to-zoom API patent. The asserted claim was rejected by the USPTO on reexamination, and the Federal Circuit (which salvaged other Apple patents in other cases) affirmed the USPTO's decision. The way I understand Samsung's motion is that the disagreement between Apple and Samsung is not about whether the '915 patent is relevant to the damages determination in the upcoming retrial. Instead, the disagreement is whether the related adjustments made by Apple and its experts were sufficient. There's nothing spectacular about those motions in limine, but they do raise some interesting issues. I'll comment again when Apple and Samsung have responded to each other's motions--particularly to each party's second motion. Microsoft has announced a "new IP strategy for a new era of shared innovation," giving customers ownership of new patents and design rights resulting from their collaboration with Microsoft, with Microsoft merely getting a license to use those technologies for the improvements of certain "platform technologies" such as Azure, Office, and Windows. Microsoft is even willing to support contributions to open source projects at a customer's request. I haven't done any consulting for Microsoft in more than four years, and even while I was doing some work for them (such as on standard-essential patents), I never received any confidential information about their strategies or the terms of their license agreements. Whatever I know, I know from publicly-accessible court filings, one of which indicated that Samsung at some point paid north of $1 billion in Android patent royalties to Microsoft during a 12-month period. In certain contexts (such as the i4i case), Microsoft actually took pro-defendant positions. While I understand that many people disliked the idea of Microsoft charging patent license fees to Android device makers, there was no exclusionary use of patents. To the extent Microsoft sought injunctive relief, it merely wanted to bring Android OEMs to the negotiating table in order to reach a license agreement. Depending on the specific terms, licensing can also be anticompetitive, but by now we all know that none of this prevented Android from succeeding, and dozens of companies (many of which would have the resources and sophistication to defend themselves in court) chose licensing over litigation. I considered many free and open source software activists hypocritical because they criticized Microsoft over almost anything it did in connection with open source while giving the rest of the industry a free pass and intentionally turning a blind eye to some other players' clearly abusive conduct. Just like other companies orchestrated antitrust complaints against Microsoft, Microsoft was in some cases proven and in other cases merely suspected to be behind initiatives targeting other large players. But if there were things that deserved to be criticized, who cares? In the information and communications technology sector, lobbying entities and NGOs that raise issues serve an important hygienic function, provided there really is fire and not just smoke. During the "Smartphone Patent Wars" it happened for the first time that Microsoft faced the threat of injunctive relief as a result of litigation brought by another large corporation: Motorola Mobility. That kind of adversary, which at some point belonged to Google, wasn't just the kind of troll that you can pay to go away (and that usually won't satisfy the eBay standard for patent injunctions). "Googlorola" wanted to gain so much leverage over Microsoft that it would have been forced to cease and desist from all litigation against Android device makers. Even during the early stages of its dispute with Motorola, Microsoft still made an often-cited filing with the Federal Trade Commission in which it advocated, or at an absolute minimum appeared to advocate, injunctions over standard-essential patents (SEPs). But that changed not much later, and by now most major players, except for mostly failed businesses that increasingly rely on patent monetization, agree that SEP injunctions shouldn't be granted. Two years ago, Google joined the Fair Standards Alliance, which promotes SEP licensing on FRAND terms. I had already done some work for Microsoft when I first took a clear "no SEP injunctions" position on this blog. I knew that Microsoft's standards group wasn't taking the same position at the time, but no one even tried to discourage me from voicing my position on this. In recent years, Microsoft's IP-related positions and priorities have apparently evolved further. The emphasis in announcements of patent license agreements between Microsoft and Android device makers appeared to shift to bundling deals: Microsoft was apparently very interested in getting companies to preinstall certain Microsoft Android apps, such as Skype. The derogatory term for this is "bloatware," and no one knows by how much Microsoft lowered those license fees, but analysts speculated that Android device makers saved a ton of money by bundling Microsoft's apps. Meanwhile, Windows Phone has been discontinued, so Microsoft has surrendered to Apple and Google with respect to mobile operating systems. It still has the Windows desktop and server business, but its growth strategy is centered around apps and services. So far, Wall Street loves that new focus, but it remains to be seen over the years whether Microsoft can fend off competition in markets in which it won't have the benefit of making the underlying operating system. I don't mean to be negative, but the jury is still out on this. The most surprising and--to me--most disappointing indication of Microsoft now being more interested in apps and services than in its own operating system platforms was when it filed an amicus curiae brief last year with Red Hat and HP, supporting Google against Oracle with respect to "fair use." Parasitic Red Hat and Oracle-obsessed HP had previously sided with Google on copyrightability; Microsoft hadn't. But with respect to "fair use" (which Android's use ofthe Java APIs isn't according to the United States Court of Appeals for the Federal Circuit), Microsoft actually sided with the weak-IP camp. I don't understand why. Maybe Microsoft would like some more freedom with respect to its own use of the Java APIs (in some enterprise applications and on the Azure cloud); maybe Microsoft is more interested in a constructive relationship with Google (unlike Oracle, Microsoft stopped funding various industry groups accusing Google of abusing its search engine monopoly); maybe Microsoft wanted to curry favor with the open source community this way; or maybe Microsoft is interested in "balance of power" (the historic British take on continental European politics) and is afraid of Apple being or becoming too powerful, so it may not want Android's success to be compromised by the Java copyright situation. Whatever the reason or combination of reasons may have been, I'd never have expected Microsoft to support Google against Oracle on "fair use." By way of contrast, the Federal Circuit concluded: "There is nothing fair about taking a copyrighted work verbatim and using it for the same purpose and function as the original in a competing platform." The "old" Microsoft--the Windows-centric one--would have been interested in reasonably strong protection of its intellectual property in APIs. The new Microsoft is apparently more interested in access to other companies' APIs. I interpret yesterday's announcement of the Shared Innovation Innovative as an indication of Microsoft continuing to modify its approach to intellectual property. It's still far from advocating the abolition of software patents, but it appears to be trying hard to be part of the sharing economy in some other ways. I wish this were just an April Fool's Day post, but sadly it's true that politicians in the EU are making ever more radical proposals concerning U.S. Internet giants. While I don't expect anything extreme to actually happen in the near term, calls for or speculation about breakups of large corporations contribute to a climate in which it becomes increasingly hard to find reasonable solutions, and to focus on actual wrongdoing by abusers of dominant market positions. It's a climate of thoughtlessness. About a week ago, EU competition commissioner Margrethe Vestager, more descriptively named Activistager, told the Telegraph that a breakup of Google into multiple smaller entities would have to remain on the table as an option for competition enforcement. No one seriously believes this would be the outcome, but just mentioning the possibility is a kind of saber-rattling that appears totally disproportionate. One may or-as the U.S. Federal Trade Commission concluded in 2013--may not consider any of Google's business practices anticompetitive. But even if one agreed with the EU Commission's charges, one can't seriously think about a breakup. Maybe some minor remedies and limited fines, but that's the maximum extent of it. Unfortunately, socialist anti-business radicalism is on the rise in Europe. The European political coordinate system has always been clearly to the left of American politics. By way of comparison, even someone like Hillary Clinton would be clearly to the right of the center of European politics--and on some issues even closer to parties considered "far-right" by European standards than to Merkel's Christian Democratic Union, which is conservative in name only, or Macron's En Marche, a movement in the tradition of French statism. But in the past there still was a huge difference between the more egalitarian, statist European approach and what would sooner or later result in five-year plans. The European debate over Internet giants and the power they accumulate--and the way they leverage their reach and their network effects--needs more reasonableness. The current trend is worrying. Mrs. Activistager should be isolated. But the "nuclear option" of breaking up companies comes up way too often in the European debate. Just this weekend, two senior German politicians said in interviews that a Facebook breakup may be necessary as a last resort. Robert Habeck, the co-chair of the German Green Party, told a newspaper that governmental intervention is warranted where there isn't enough competition. Mr. Habeck described Facebook as a "data superpower" that owns too many services, including WhatsApp, and aggregates all of their data. Therefore, he believes competition law needs to evolve in order to be able to break up such giants. In Europe, the Greens are more influential than anywhere else in the world. They regularly join government coalitions in different European countries, and in the European Parliament they sometimes have the power to tip the scales in narrow votes. Most of the time they side with center-left parties, but sometimes also with European conservative-in-name-only parties. Merkel and her closest circle of allies and advisers tried to form a government with the Greens last year, but failed because the somewhat libertarian Free Democratic Party didn't just want to provide the missing votes to Merkel's strategic alliance with the Greens. The reason I described the Free Democratic Party as "somewhat libertarian" is that it, too, increasingly adopts left-wing populist positions. For instance, the FDP supports Activistager's "state aid" case against Apple and the EU Commission's "digital tax" plans. And the vice chair of the FDP group in the German parliament, Michael Theurer, told Germany's leading financial daily, Handelsblatt, that a corporate breakup would be a "massive governmental intervention and, besides governmental regulation, a last resort"--but even he, while preferring to explore ways to build competitive pressure through innovation, didn't want to rule out a breakup of Facebook. Mr. Theurer says that the "platform economy" has a tendency to result in monopolies and "a high concentration of power." Therefore, the libertarian-in-name-only politician, like the Green leader I mentioned before, believes competition law as it exists is insufficient to address the digital economy and urges its "further evolution." While former Pirate Party leader and social democrat Christopher Lauer is far less influential, the leading Berlin newspaper, Der Tagesspiegel, published an op-ed of his last week in which he demanded the "nationalization" of Facebook. Whatever conclusions Facebook may have to draw from the Cambridge Analytica affair, politicians in Europe, and especially in the largest EU member state, should be more careful about the measures they propose. Radical ideas, even if described as a last resort by some (not all) of their proponents, distract from real issues (such as Europe's abysmal failure in the digital platform economy) and from the quest for real solutions, and are particularly unhelpful on the brink of a trade war. Europe should try to stay in the global competition enforcement mainstream. But in the Age of Activistager, that may be too much to ask for.